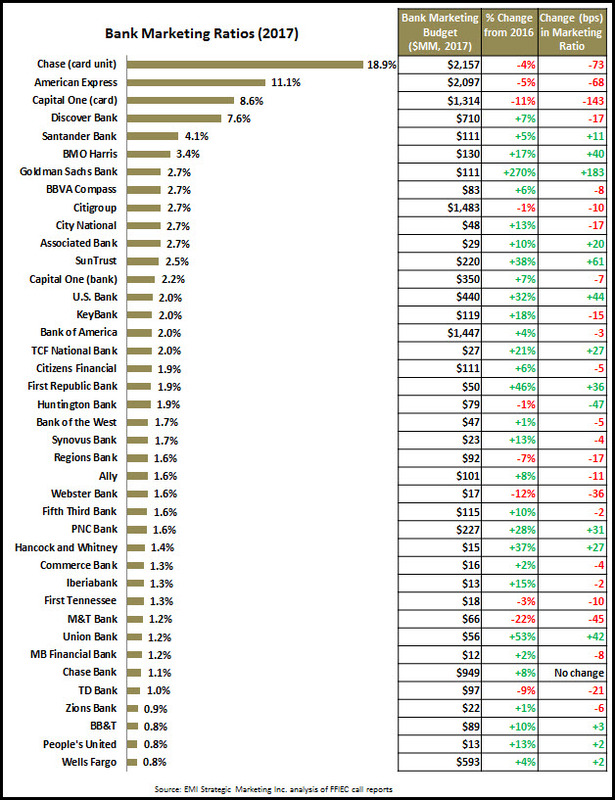 Allowing banks to reduce branch density…and more easily expand into new markets. With the growth of online and mobile banking, branches account for a significantly decreased share of everyday banking transactions, so most banks have been able to reduce their branch density, which saves costs while enabling banks to maintain a physical presence in markets. 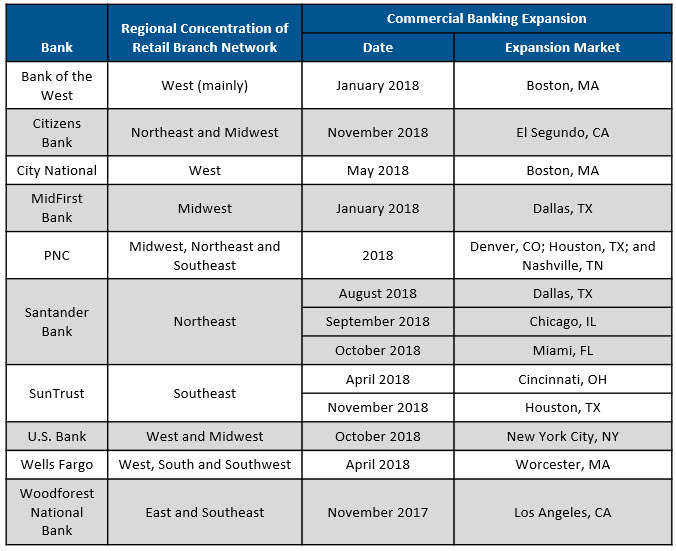 Bank of America reported that its branch network has declined from 6,100 to 4,400 during the past decade, but also referred to plans to open 500 branches in new markets. Similarly, Regions discussed plans to open 20 de novo branches in new markets in 2018, while also closing 30-40 branches. Building a national presence. Banks that already have a limited branch presence are looking to leverage their brand strength and develop a national presence by creating a digital bank. Citibank recently announced that it was creating a national digital bank. Similarly, PNC reported that it would begin rolling out a national digital strategy later in 2018, which it claimed would enable it to take advantage of its brand awareness and serve more customers beyond its traditional retail banking footprint. Enhancing the customer experience. Banks are investing in digital service channels not only to provide a wider range of functionality to clients, but also to enrich the customer experience. In doing so, banks can improve customer satisfaction and boost retention levels. Regions discussed its goal of providing a consistent experience, with customers seeing the same information and having access to the same capabilities across all channels. The shift to electronic self-service channels also reduces servicing costs; Citibank reported that call center volume fell by 12 million phone calls in 2017. Communicating through new marketing channels. Banks are significantly changing their media mix and messaging to reflect the channels where people are now consuming information and entertainment, and to communicate to clients and prospects in fresh new ways. In its 1Q18 earnings conference call, BB&T discussed that it is ramping up its digital marketing campaigns; 86% now have a digital component. Capturing new sales opportunities and lowering average cost per acquisition. As customers increasingly use digital channels for their banking activities, they become more receptive to using these same channels to open new accounts and/or upgrade existing products and services. As a result, many banks are reporting strong growth in digital sales. Wells Fargo recently launched a digital mortgage application and noted that 10% of its mortgage applications in March 2018 came through that capability. The number of BB&T business accounts opened online rose 43% y/y and retail savings accounts grew 96%. Bank of America reported that digital accounted for 26% of all sales. It also rolled out an auto shopping app, with auto loans sourced digitally accounting for 50% of all direct auto loan originations in the first quarter. While strategic investments in digital channels can lead to significant bottom-line benefits, banks should be careful not see this progress as proof that they no longer need human channels. A recent J.D. Power survey found that satisfaction levels are lowest for retail banking clients who exclusively use online or mobile channels and highest for “branch-dependent digital customers.” Moreover, the gap in satisfaction levels is highest for Millennial customers, underscoring this demographic segment’s affinity for branches. And while digital sales for many banking products are growing strongly, human channels are still vital for a bank’s success. This means that banks must develop an integrated channel strategy, with digital and human channels acting in synch—and indeed actively promoting each other. Bank of America provided a great example of this synergy in operation in its 1Q18 earnings conference call: clients used its digital channels to schedule an average of 35,000 branch appointments per week during the quarter. Full integration of digital and human channels recognizes the particular strengths and limitations of different channels, and can optimize a bank’s return on its investments in marketing, sales and the customer experience.